The latest version of Posijet®, a mobile unit for the preparation and injection of high-energy radiopharmaceuticals, has become the compact and mobile reference solution for nuclear medicine services. Designed by Lemer Pax, optimized in collaboration with the Confluent Group, Posijet® V3 is a great success in France and internationally. 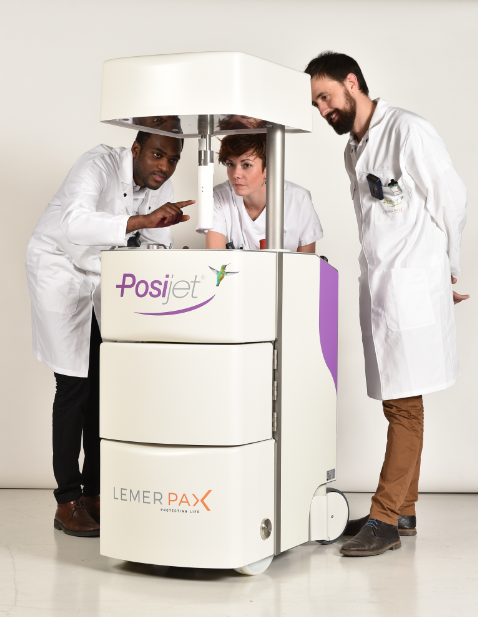 The Francophone Nuclear Medicine Days (JFMN), from 18 to 21 May, in Nantes (France), will enable Lemer Pax and the Nantes Confluent hospital group to display the results of a successful collaborative work around the Posijet®, marked by the signature of a partnership agreement last March. After several months of use in the nuclear medicine department of the Confluent Group and over 1,000 patients injected with 4 different tracers of 18F, Lemer Pax was able to refine its latest version of Posijet® V3 and adapt it to the needs of users. Thus, to ensure greater comfort of the latter in the injection room and PET scan room, the latest software update multiplies the new functionalities by connecting always more the Posijet® to the IS of the hospital: real-time visualization, drug configuration, lists of injections performed and quality controls result are now accessible remotely on touch-screen tablets or smartphones. Rationalization and optimization of the activity at the service of the patient. Read more.